An open great room for gathering and three bedrooms designed with privacy in mind make this exciting home perfect for the active young family. The great room features a fireplace, cathedral ceiling, and built-in bookshelves. The kitchen is designed for efficiency with its food preparation island and pantry. The master suite with cathedral ceiling, walk-in closet, and luxurious bath provides a welcome retreat. 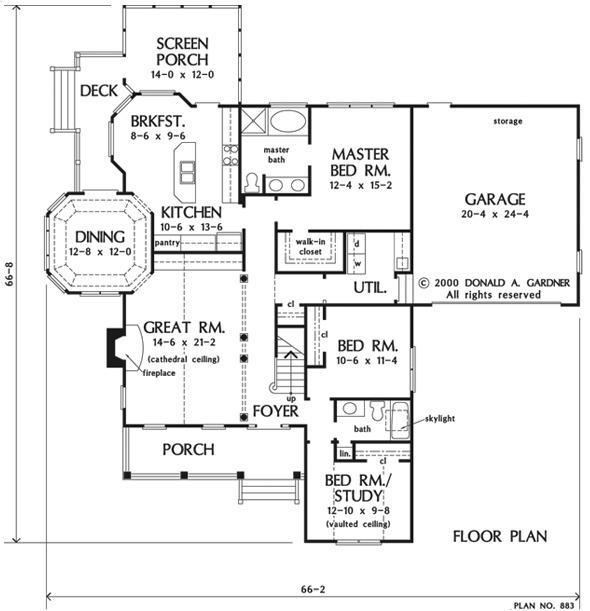 Two additional bedrooms share a skylit bath, and a huge second floor bonus room makes a perfect play area. 1st Floor: 1819 Sq. Ft. 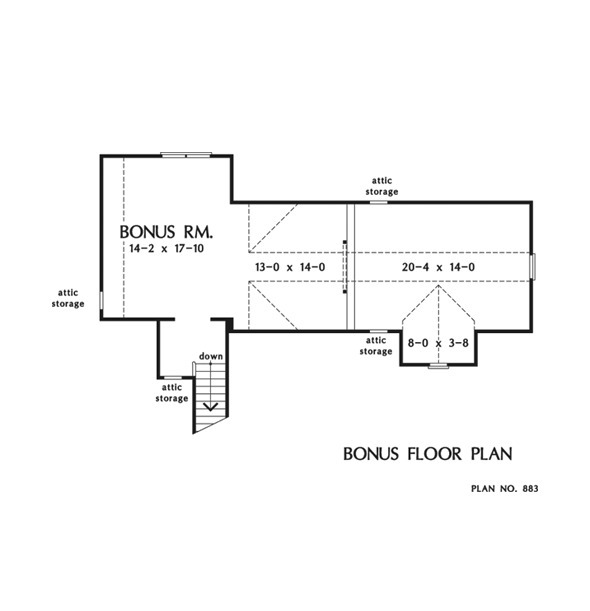 Bonus Room: 797 Sq. Ft.
Porch - Front : 22' 6" x 6' 6" x 0' 0"
Deck / Patio : 6' 0" x 17' 2" x 0' 0"
Other : 7' 4" x 6' 2" x 8' 0"
Master Bedroom : 12' 4" x 15' 2" x 9' 0"
Bedroom / Study (Vaulted): 12' 10" x 9' 8" x 11' 0"
Bedroom #3 : 10' 6" x 11' 4" x 9' 0"
Foyer : 7' 4" x 3' 10" x 9' 0"
Dining Room (Tray): 12' 8" x 12' 0" x 10' 6"
Great Room (Cathedral): 14' 6" x 21' 2" x 15' 4"
Kitchen : 10' 6" x 13' 6" x 9' 0"
Breakfast Room : 8' 6" x 9' 6" x 9' 0"
Utility Room : 8' 0" x 8' 10" x 9' 0"
Bonus Room (Vaulted): 14' 2" x 17' 10" x 8' 0"